Queensland, the state occupying the northeastern quarter of Australia, has a long, tropical coastline facing the Coral Sea and fringed by the famous Great Barrier Reef. This coastline ends at Cape York, the northernmost point of the Australian continent. Beyond Cape York, the Torres Strait separates Australia from New Guinea and provides a passage from the Coral Sea (a basin of the Pacific Ocean) to the Arafura Sea (the easternmost arm of the Indian Ocean). This page includes lighthouses of the Far North region of Queensland, including the Cape York Peninsula and the east coast south through the Cairns area. Pages for Northern and Central Queensland and Southern Queensland for lighthouses in the rest of the state. 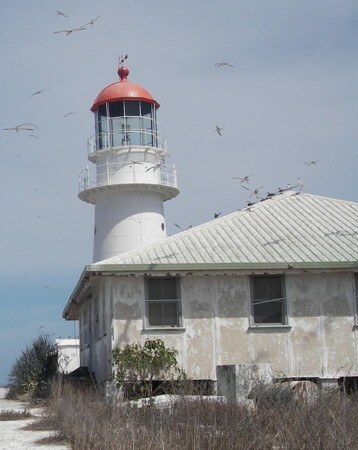 Coastal lighthouses in Australia are operated by the Australian Maritime Safety Authority (AMSA), but after automation AMSA transferred many of the station properties to the control of local or state authorities or organizations. ARLHS numbers are from the ARLHS World List of Lights. Admiralty numbers are from volume K of the Admiralty List of Lights & Fog Signals. U.S. NGA numbers are from Publication 111. The section of the Lighthouses of Australia site devoted to Queensland lights. Index to Wikipedia articles; most include photos. Photos posted by Andreas Köhler. This site, posted by Kevin Mulcahy, has a comprehensive list of Australian lighthouses and links to photos of some of them. Navigation chart information for the Cape York Peninsula and Torres Strait. Note: Burketown is a small town 30 km (19 mi) inland on the Albert River, which flows into the southern end of the Gulf of Carpentaria. Date unknown. Active; focal plane 9 m (30 ft); white flash every 6 s. 9 m (30 ft) tower. NGA describes a skeletal tower but Google's satellite view appears to show a round concrete tower. No photo available. Located on the beach about 1500 m (0.9 mi) east of the river mouth. Site open, tower closed. Admiralty K3304.8; NGA 9582. Note: Karumba is a fishing port at the mouth of the Norman River in the southeastern corner of the Gulf of Carpentaria. Date unknown. Active; focal plane about 20 m (66 ft); continuous white light. Approx. 20 m (66 ft) skeletal tower mounted on a square platform or pier. No photo available but Bing has a satellite view. The front light is on a similar but shorter tower. Located at the edge of a shoal west of the river mouth. Accessible only by boat. Site open, tower closed. Admiralty K3304.21. Note: Weipa is the largest town on the west coast of the Cape York Peninsula. The surrounding area has large deposits of bauxite, and the port of Weipa ships that mineral from the world's largest bauxite mine. Date unknown. Active; focal plane 44 m (144 ft); a continuous green light is shown at night and a continuous white light during the daytime. Approx. 35 m (115 ft) slender steel tower colored white. Google has a street view and a satellite view. Located beside a road at Evans Landing, on the south side of Weipa. Site open, tower closed. Admiralty K3298.1; NGA 9616. Date unknown. Active; focal plane 14 m (46 ft); a continuous green light is shown at night and a continuous white light during the daytime. 13 m (43 ft) round cylindrical metal tower painted white. A portion of Jon Morris's street view is at right, Lesley Bray has a closeup photo, and Google has an indistinct satellite view. 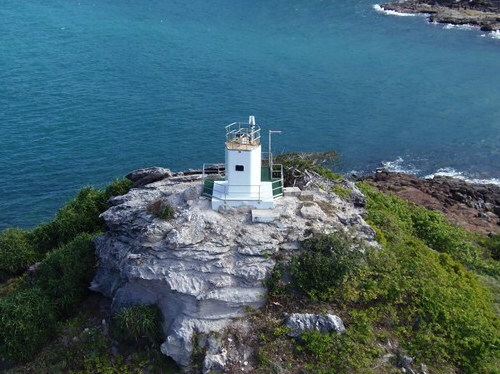 Located at Gonbung Beach, a short spit projecting into the north side of the harbor, 2.75 km (1.7 mi) west southwest of the rear light. Site open, tower closed. Admiralty K3298; NGA 9612. Date unknown. Active; focal plane 49 m (161 ft); white flash every 5 s. 28 m (92 ft) steel skeletal tower. A Fresnel lens formerly used at this station is on display at the Townsville Maritime Museum, and the original lantern is on display at the Macquarie Lighthouse museum near Sydney. A distant view is available, and Google has an indistinct satellite view. This is the landfall light for Weipa. Duyfken Point, on the north side of Albatross Bay, is the first point of Australia discovered by a Western explorer: the Dutch captain Willem Janszoon, in his ship Duyfken, spotted this point in 1606. Located on the cape, about 35 km (22 mi) west of Weipa. Site status unknown. Admiralty K3297; NGA 9596. 1917. Wrecked in 1979. Steel lightship; the light was displayed from a central mast. The ship was dragged from its station on the Carpentaria Shoal by Tropical Cyclone Greta in January 1979. It beached south of Vrilya Point about 100 km (60 mi) southwest of Cape York. AMSA abandoned the ship, leaving it to rust on the beach. The wreck was still upright in a 2008 photo, but shortly thereafter it collapsed onto the sand, as seen in a more recent photo (click on #4). Google has a satellite view. The lightship was replaced on the shoal by a modern lightfloat (NGA 9592). Site open. Note: The Torres Strait is about 150 km (93 mi) wide between Cape York and the southern coast of Papua New Guinea. Shallow and difficult to navigate, the strait is also strewn with about 275 islands, 17 of them large enough to be inhabited. Australia has sovereignty over all the islands of the strait and controls shipping through the passage. The channel used by international shipping, known as the Great Northeast Channel, passes north of Prince of Wales island off Cape York, and then angles northeastward across the strait to end close to the Papuan coast. Since 2006 Australia has required that ships passing through the strait make use of Australian pilots. The Torres Pilots agency has a map of the route. 1890. Active; focal plane 37 m (120 ft); white flash every 7.5 s. 18 m (59 ft) wood frame tower covered with galvanized iron sheets, with lantern and gallery, painted white; dome of lantern painted red. The original 2nd order Fresnel lens, removed in 1991, is on display at the Green Hill Fort Museum on Thursday Island. Several 1-story keeper's houses and other buildings, formerly occupied by wildlife service personnel, now incorporated into a Torres Pilots base. A photo by J. Warnes is at right, Ashley Whatson has a view from the sea, and Wikimedia has an aerial photo and another view from the sea, but nothing of the light is seen in Google's very distant satellite view. Booby Island, located about 50 km (30 mi) west northwest of Cape York, marks the western entrance to the Great Northeast Channel through the Torres Strait. So many ships were wrecked here in the nineteenth century that provisions were kept stocked on the island for wrecked seamen. 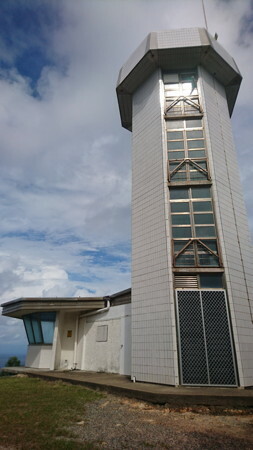 Located at the highest point of the island. Accessible only by boat. Site and tower closed; special permission is required to land on the island. Operator: AMSA. Site manager: Queensland National Parks (Round Island Conservation Park). ARLHS AUS-011; Admiralty K3274; NGA 9620. 1886. Active; focal plane 105 m (345 ft); quick-flashing white light. Approx. 10 m (33 ft) wood frame tower covered with galvanized iron sheets, with lantern and gallery. Lighthouse painted white; dome of lantern painted red. The original 4th order Fresnel lens remains in use. Keeper's houses in ruins. David Denholm's photo is at the top of this page and Google has a distant satellite view of the station. The range guides vessels eastward in the first reach of the Great Northeast Channel. The front range light is a short fiberglass tower. Located atop the rocky island, about 27 km (17 mi) northwest of Cape York and 25 km (16 mi) east of Booby Island. Accessible only by boat. Site and tower closed. Operator/site manager: AMSA. ARLHS AUS-232; Admiralty K3270.1; NGA 9628. Date unknown. Active; focal plane 40 m (131 ft); three flashes every 15 s, white or red depending on direction. 6 m (20 ft) round white fiberglass tower. A view from the sea is available and Google has a satellite view. Located at the northeastern point of Wednesday Island, about 25 km (15 mi) northwest of Cape York. Accessible only by boat. Site and tower closed. Operator/site manager: AMSA. Admiralty K3262; NGA 9660. Date unknown. Active; focal plane 25 m (82 ft); white light, 2 s on, 8 s off. 15 m (49 ft) hexagonal cylindrical fiberglass tower colored with a red and white checkerboard pattern. No photo available but Google has a satellite view. The original lighthouse was a square pyramidal skeletal tower and the second lighthouse was a square cylindrical tower. The range guides eastbound vessels in the Prince of Wales Channel, an east-west reach. Located on a small island about 25 km (15 mi) north of Cape York. Accessible only by boat. Site and tower closed. Operator/site manager: AMSA. Admiralty K3258.1; NGA 9684. Date unknown. Active; focal plane 16 m (52 ft); three white flashes every 15 s. 13 m (43 ft) steel skeletal tower. No photo available and the tower is not seen in Google's distant satellite view. Located at the west end of a small island in the center of the Torres Strait. Accessible only by boat. Site and tower closed. Operator/site manager: AMSA. Admiralty K3285; NGA 9704. Date unknown. Active; focal plane 24 m (79 ft); white flash every 5 s. 21 m (69 ft) steel skeletal tower. No photo available and the tower is not seen in Google's distant satellite view. Dalrymple has a Torres Pilots base and marks the eastern end of the piloted section of the Great Northeast Channel. Located at the west end of a small island in the center of the Torres Strait. Accessible only by boat. Site and tower closed. Operator/site manager: AMSA. Admiralty K3288; NGA 9708. 1954 (station established 1924). Active; focal plane 19 m (62 ft); four white flashes, separated by 2.5 s, every 15 s. 19 m (62 ft) square stainless steel skeletal tower, painted white. A sunset photo is available, and there's a photo taken from atop the tower, but the tower is not seen in Google's satellite view. 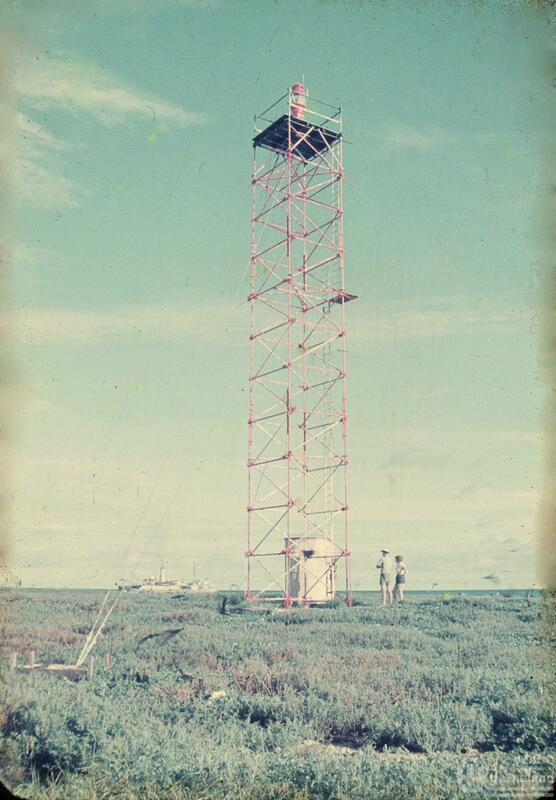 The University of Queensland has a photo of the original lighthouse, a square cylindrical skeletal tower. This is Australia's northernmost aid to navigation, standing in latitude 9°08.5' S. The light tower marks the northern end of the Great Barrier Reef and the eastern entrance to the Great Northeast Channel. Located in the Gulf of Papua about 230 km (140 mi) northeast of Cape York. Accessible only by boat. Site and tower closed. Operator/site manager: AMSA. ARLHS AUS-280; Admiralty K3292; NGA 9712. 2000-01. 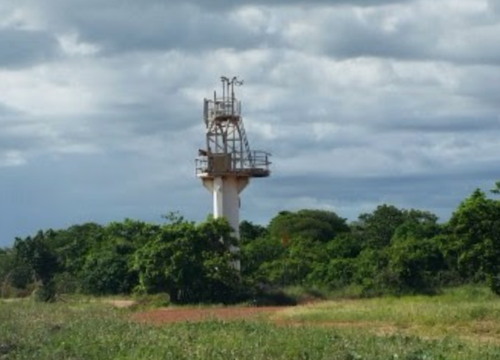 Active; focal plane 32 m (105 ft); white flash every 10 s. 31 m (102 ft) structure; in NGA's description this includes a "red fiberglass tower, on metal framework tower, on 4-piled structure with helipad connected by walkway." A 2011 photo of this unusual lighthouse is available. This light marks the beginning of the approach to the Torres Strait from the Coral Sea. Located on a reef about 50 km (30 mi) southeast of Bramble Cay. Accessible only by boat. Site and tower closed. Operator/site manager: AMSA. Admiralty K3290; NGA 9714. Note: Named by Capt. James Cook in 1770, Cape York is the northernmost point of the Australian continent and represents the northeastern corner of the country. Although the cape is quite remote, being 750 km (470 mi) north of the paved highway at Lakeland, it is accessible to 4WD vehicles during the dry season (May through November), and hundreds of adventurous tourists make this trek every year. 2012 (station established 1921). Active; focal plane 35 m (115 ft); two white flashes every 10 s; the light shown is white, green, or red depending on direction. 6 m (20 ft) hexagonal cylindrical white fiberglass tower. No photo of the current light available but Google has an indistinct satellite view. The original lighthouse was a square cylindrical concrete tower with lantern and gallery, painted white. John Benwell has a 2007 photo. In 2012 AMSA replaced the deteriorated Eborac Island and Albany Rock lighthouses with hexagonal fiberglass towers; the contractor, CivilPlus Constructions, has a page on the project. The lighthouse guides ships into the northern end of the protected coastal channel, inside the Great Barrier Reef. Located atop a rocky island just off Cape York. 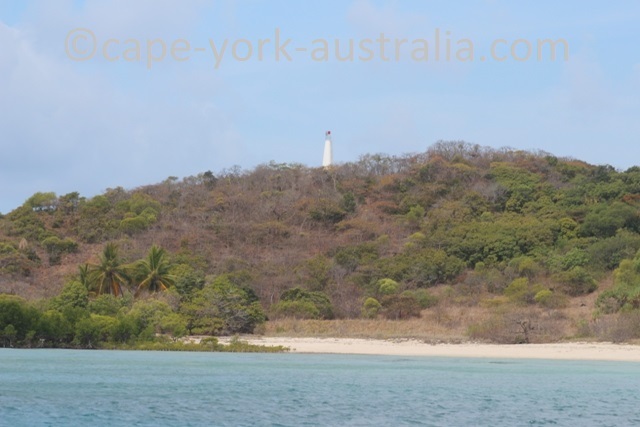 Accessible only by boat but visible from the point of Cape York, which can be reached by 4WD. Site and tower closed. Operator/site manager: AMSA. ARLHS AUS-189; Admiralty K3256; NGA 9724. 2012 (station establishment date unknown). Active; focal plane 26 m (85 ft); flash every 5 s, white, red, or green depending on direction. 6 m (20 ft) hexagonal cylindrical white fiberglass tower. A photo is at right, and Google has a satellite view. The two white sectors of this light guide ships in the narrow channel along the east side of Cape York. In 2012 AMSA replaced the deteriorated Eborac Island and Albany Rock lighthouses with fiberglass towers; the contractor, CivilPlus Constructions, has a page on the project. 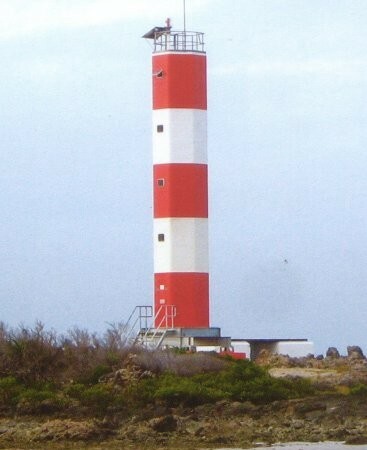 The original lighthouse was a square cylindrical concrete tower with lantern and gallery, painted white. A distant view is available (a little more than halfway down the page) and the University of Queensboro has a closeup historic photo. Located about 10 km (6 mi) southeast of Cape York. Accessible only by boat. Site and tower closed. Operator/site manager: AMSA. ARLHS AUS-002; Admiralty K3254; NGA 9728. Date unknown. Active; focal plane 21 m (70 ft); four flashes every 20 s, white or red depending on direction. 21 m (70 ft) square stainless steel skeletal tower with lantern and gallery, mounted on four concrete piles. Lantern painted white. Pilings of a former lighthouse nearby. Wikimedia has an aerial photo by J. Warnes, Lightphotos.net has a wider version of the same photo, and Google has a satellite view. Located on a reef about 16 km (10 mi) southeast of Albany Rock. Accessible only by boat. Site and tower closed. Operator/site manager: AMSA. ARLHS AUS-283; Admiralty K3252; NGA 9732. 1844. Never lit as a lighthouse, but the tower functions as a daybeacon. Approx. 10 m (33 ft) round 4-stage stone tower. A photo is at right, Paul Sutherland has photos, and Google has an indistinct satellite view. The oldest European structure in tropical Australia, the beacon was built by convict labor at the order of the British Admiralty. It marks a dangerous passage through the Great Barrier Reef, known as the Raine Island Passage or as the Pandora Passage after HMS Pandora, which wrecked nearby on 29 August 1791 after participating in the search for HMS Bounty. The island is the world's largest nesting site for endangered green turtles. 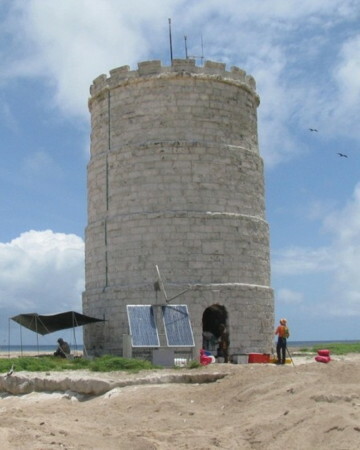 The Raine Island Corporation, which manages research activities on the island, restored the tower in 1994. Located atop the island, on the Great Barrier Reef about 120 km (75 mi) east northeast of Cape Grenville. Accessible only by boat or helicopter. Site and tower closed to the public (wildlife reserve). Owner: Queensland National Parks (Raine Island National Park). Site manager: Raine Island Corporation. ARLHS AUS-141. Date unknown. 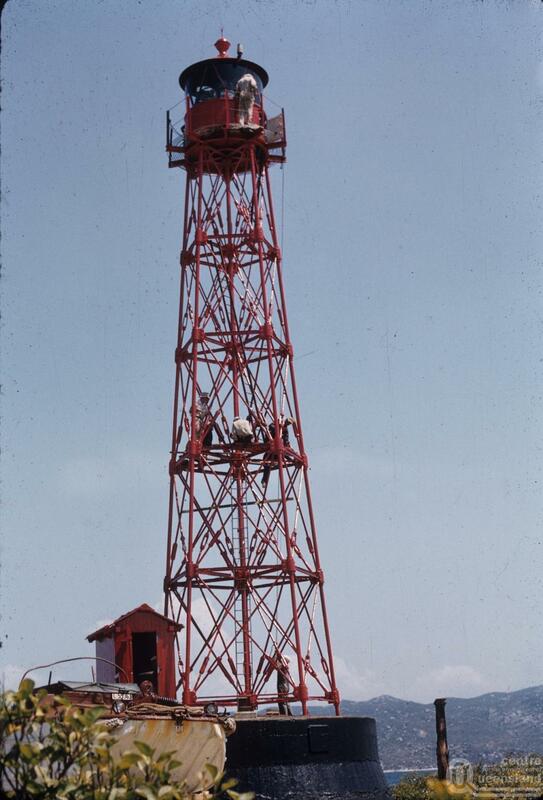 Active; focal plane 27 m (89 ft); three white flashes every 15 s. 21 m (69 ft) square cylindrical skeletal tower, painted red; the small lantern is painted white. No photo available but Google has a satellite view. 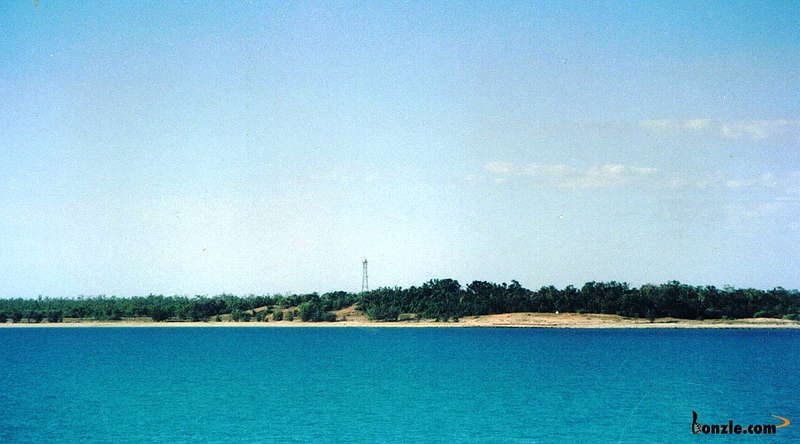 Cairncross is a small island about 15 km (9 mi) offshore and 100 km (60 mi) southeast of Cape York. The light marks the north end of a narrow passage close to the coast of the Cape York Peninsula between Cape York and Cape Grenville. Located on the northwestern tip of the island. Accessible only by boat. Site and tower closed. Operator/site manager: AMSA. Admiralty K3250; NGA 9736. Date unknown. Active; focal plane 26 m (85 ft); two white flashes every 8 s. 22 m (72 ft) square cylindrical skeletal tower, painted red. No photo available but Bing has a very distant satellite view. The light marks the south end of a narrow passage close to the coast of the Cape York Peninsula between Cape York and Cape Grenville. Located on an island at the northeastern corner of the Hannibal Reef, about 50 km (30 mi) north of Cape Grenville. Accessible only by boat. Site and tower closed. Operator/site manager: AMSA. Admiralty K3248; NGA 9740. 2006 (station established 1990) . Active; focal plane 21 m (69 ft); flash every 2.5 s, white or red depending on direction. 21 m (69 ft) hexagonal cylindrical fiberglass tower, painted with red and white horizontal bands. AMSA's photo is at right and Bing has a distant satellite view. This light marks a sharp (60°) turn in the inside passage along the coast of the peninsula. The new lighthouse replaced a skeletal tower. Located on a reef off the easternmost of the Home Islands, a group of islands lying just off the point of Cape Grenville. Accessible only by boat. Site open, tower closed. Operator/site manager: AMSA. Admiralty K3244; NGA 9744. Date unknown (lightship station established 1876). Active; focal plane 12 m (39 ft); four white flashes every 20 s. 12 m (39 ft) square pyramidal skeletal tower with lantern and gallery, painted red and mounted on concrete piles. A 1970 photo is available, and Google has a satellite view. This light marks the very narrow passage between Piper Reef and Inset Reef on the inside passage along the coast. Located at the east end of Piper Reef about 30 km (19 mi) south of Cape Grenville. Accessible only by boat. Site open, tower closed. Operator/site manager: AMSA. Admiralty K3242; NGA 9756. Date unknown. Active; focal plane 38 m (125 ft); two white flashes every 8 s. 5 m (16 ft) white fiberglass tower. Irene Young has a photo but the tiny tower is hard to spot in Google's satellite view. This light guides ships past the headland of Cape Weymouth. Accessible only by boat. Site open, tower closed. Operator/site manager: AMSA. Admiralty K3240; NGA 9768. Date unknown. Active; focal plane 18 m (59 ft); flash every 5 s, white or red depending on direction. 14 m (46 ft) stainless steel skeletal tower mounted on a concrete platform supported by piles. A helipad is on an adjoining platform. No photo available but Google has a satellite view. The original lighthouse was nearly identical to the present one. Located on a reef about 12 km (7.5 mi) northeast of Lockhart River, the northernmost town on the east coast of Queensland. Accessible only by boat. Site open, tower closed. Operator/site manager: AMSA. Admiralty K3236; NGA 9776. Date unknown. Active; focal plane 21 m (69 ft); two flashes every 8 s, white or red depending on direction. 20 m (66 ft) skeletal tower mounted on a concrete platform supported by piles. No photo available and the light is not seen in Google's satellite view of the location. Located on a reef about 11 km (7 mi) east of Chapman Island. Accessible only by boat. Site open, tower closed. Operator/site manager: AMSA. Admiralty K3235.575; NGA 9774. Date unknown. Active; focal plane 18 m (59 ft); four white flashes every 20 s. 19 m (62 ft) skeletal tower mounted on a concrete platform supported by piles. A helipad is on an adjoining platform. No photo available but Google has a satellite view. Located on a reef about 16 km (10 mi) south of Chapman Island. Accessible only by boat. Site open, tower closed. Operator/site manager: AMSA. Admiralty K3234; NGA 9780. Date unknown. Active; focal plane 22 m (72 ft); two flashes every 8 s, white, red or green depending on direction. 20 m (66 ft) white fiberglass tower mounted on a square platform. No photo available but Google has a distant satellite view. Two narrow white sectors guide vessels past a large area of dangerous reefs. Accessible only by boat. Site open, tower closed. Operator/site manager: AMSA. Admiralty K3235.05; NGA 9781. Date unknown. Inactive since 2015. This was a 23 m (75 ft) skeletal tower, painted red. No photo available and the tower is not seen in Google's indistinct satellite view. The tower may have been removed. Located on an island at the northwestern entrance to Princess Charlotte Bay. Accessible only by boat. Site open, tower closed. Operator/site manager: AMSA. ex-Admiralty K3228; ex-NGA 9800. Date unknown. Active; focal plane 21 m (69 ft); white flash every 7.5 s. 21 m (69 ft) post with a square fiberglass cabinet and double gallery. No photo available and the tower is not seen in Google's distant satellite view. 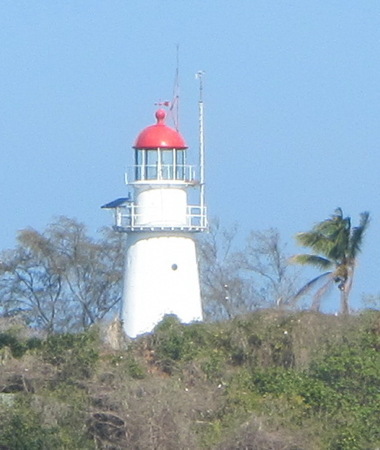 This light marks a narrow passage between reefs about 50 km (30 mi) northwest of Cape Melville. Accessible only by boat. Site open, tower closed. Operator/site manager: AMSA. Admiralty K3223.2; NGA 9801. Date unknown (station established 1901). Active; focal plane 26 m (85 ft); three flashes every 15 s, white or red depending on direction. 25 m (82 ft) square skeletal tower, painted white, mounted on a square concrete pier. No photo available but Bing has a satellite view. 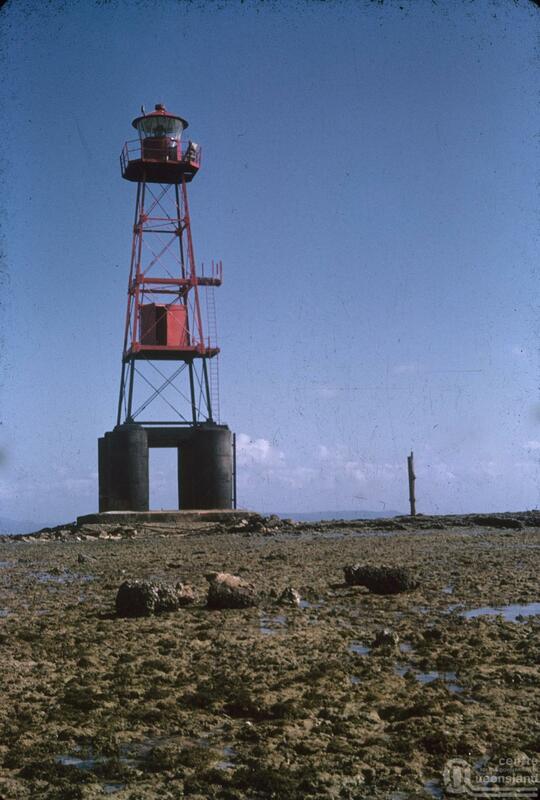 There is a 1970 photo showing the earlier lighthouse, a red pentagonal skeletal tower with lantern and gallery. 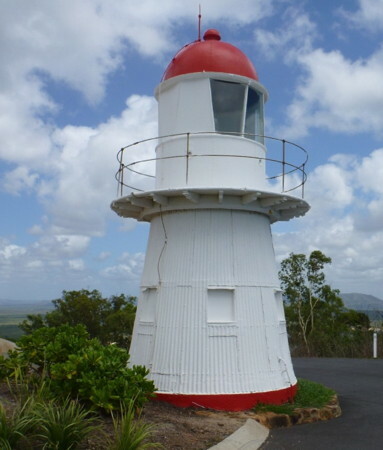 This lighthouse guides vessels through a narrow passage around the point of Cape Melville. Located on the southwest side of the Pipon Reef, about 5 km (3 mi) northwest of the cape. Accessible only by boat. Site open, tower closed. Operator/site manager: AMSA. Admiralty K3224; NGA 9820. Date unknown. Active; focal plane 26 m (85 ft); white flash every 5 s. 22 m (72 ft) skeletal tower, painted red. No photo available but Google has a satellite view. Located on an island about 80 km (50 mi) southeast of Cape Melville. Accessible only by boat. Site open, tower closed. Operator/site manager: AMSA. Admiralty K3219; NGA 9840. Date unknown. Active; focal plane 80 m (262 ft); four white flashes, separated by 2 s, every 16 s. 9 m (30 ft) square white concrete tower. No photo available, but Google has an indistinct satellite view. Located on a small island off the southwest side of the larger Lizard Island, about 30 km (19 mi) off the mainland. Site status unknown. Operator: AMSA. Site manager: Lizard Island National Park. Admiralty K3216; NGA 9848. Note: Except for the aboriginal village of Lockhart River, Cooktown is the northernmost town on the Pacific coast of Queensland. It is named for Capt. James Cook, who spent seven weeks here in 1770 repairing his ship Endeavour. The town was founded after gold was discovered nearby in 1872. It is the administrative center for Cook Shire, which includes most of the Cape York Peninsula. The current population is about 2300. Date unknown. Active; focal plane 27 m (89 ft); three white flashes every 15 s. 24 m (79 ft) square skeletal tower, painted red. No photo available, but Google has a satellite view. Located at the northeastern tip of a small island about 16 km (10 mi) off the coast and 50 km (30 mi) north northeast of Cooktown. Accessible only by boat. Site open, tower closed. Site manager: Queensland National Parks (Three Islands Group National Park). Admiralty K3214; NGA 9864. 1886. Active; focal plane 162 m (530 ft); two white flashes every 6 s. 6 m (20 ft) wood frame tower covered with galvanized iron sheets, with lantern and gallery. Lighthouse painted white; lantern dome is red. Lighthouse prefabricated in England. The keeper's houses where demolished after the lighthouse was automated in 1927. Bill Dutfield's photo is at right, Beck Lee has a 2008 photo, a 2018 photo is available, Sheri Bain has a closeup, and Google has a 2015 street view and a satellite view. The lighthouse may have been deactivated for a time around 1990 before being restored through efforts of the Cooktown Lions Club. It was repainted and refurbished in 2010. Grassy Hill is a municipal park including the lighthouse and a monument to Captain James Cook, who beached his ship Endeavour here for repairs in 1770 after it was damaged on the Great Barrier Reef. It was on Grassy Hill that Captain Cook's crew had the first European encounter with kangaroos. Located on the south side of the entrance to the Endeavour River in Cooktown, the northernmost port of the Queensland coast. Accessible by road; parking provided. Site open, tower closed. Operator: Maritime Safety Queensland. Site manager: Cook Shire Council. ARLHS AUS-083; Admiralty K3208; NGA 9868. 1979 (station established 1883). Active; focal plane 65 m (213 ft); four flashes, separated by 2 s, every 20 s; flashes are red, white, or green depending on direction. 6 m (19 ft) square concrete equipment room with lantern. Building unpainted; lantern painted white. Lighthouses of Australia has a page for the lighthouse, Mark Maupin has a good closeup photo, Bryce Purden has a street view, and Google has a satellite view. 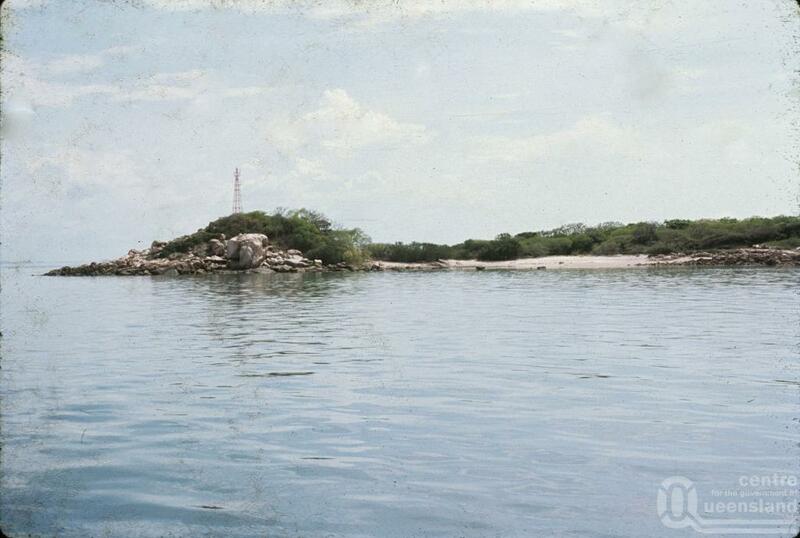 The original lighthouse was one of the many galvanized iron towers similar to the Low Isles lighthouse (see below). The original lens is on display at the Queensland Maritime Museum in Brisbane. Until 1996 the light also served as the rear light of a range with the Rocky Islet lighthouse (next entry) as the front light; the range guided vessels past the Cairns Reef. Located on a headland about 14 km (9 mi) southeast of Cooktown. Accessible by a gravel road 12 km (7.5 km) off the main road to Cooktown. Site open, tower closed. Operator/site manager: AMSA. ARLHS AUS-182; Admiralty K3200; NGA 9888. 1979(?) (station established 1883). Inactive since 1996. 6 m (19 ft) square concrete equipment room with lantern. Building unpainted; lantern painted white. Lesley Bray has a photo, and Bing has a satellite view. The original lighthouse was a round tower with lantern and gallery. Located on a small island about 1.5 km (1 mi) southeast of the Archer Point Lighthouse. Accessible only by boat. Site open, tower closed. Note: Port Douglas is a town about 70 km (40 mi) north of Cairns; its population is about 3500. 1878 (W.P. Clark). Active; focal plane 20 m (65 ft); white flash every 10 s; also a directional light displayed to the southeast, white, red or green depending on direction, 1 s on, 1 s off. 18 m (60 ft) wood frame tower covered by galvanized iron sheets, with lantern and gallery; solar-powered lens. Lighthouse painted white; lantern dome is red. The original 3rd order Chance Brothers Fresnel lens is on display at the Port Douglas Court House Museum. Two modern keeper's houses (1960s). For a number of years the assistant keeper's house was occupied by the Low Isles Research Station of the University of Queensland, but this station has been closed. A portion of Robert Linsdell's 2012 view from the sea is at right, Steve Stringer has a good photo, another photo is available, Peter Nijenhuis has a view from the sea, and Google has a satellite view. Steve Irwin (the Crocodile Hunter), Australia's famous wildlife expert and television personality, was killed on a dive just off the Low Isles in September 2006. The Low Isles Preservation Society works for preservation of the light station. The interior and exterior of the lighthouse were painted in early 2018. Located on a small island inside the Great Barrier Reef, about 13 km (8.5 mi) northeast of Port Douglas, marking the shipping channel to the port. Accessible only by boat; tours from Cairns and Port Douglas are available. Site open, tower closed. Operator: AMSA. Site managers: Queensland National Parks (Great Barrier Reef Coast Marine Park). ARLHS AUS-102; Admiralty K3194; NGA 9896. 1911 (?) (station established 1879. Inactive since 1997. Approx. 7 m (23 ft) square cylindrical tower with lantern, painted white; lantern roof is red. Köhler has a 2015 closeup photo and Google has a satellite view. 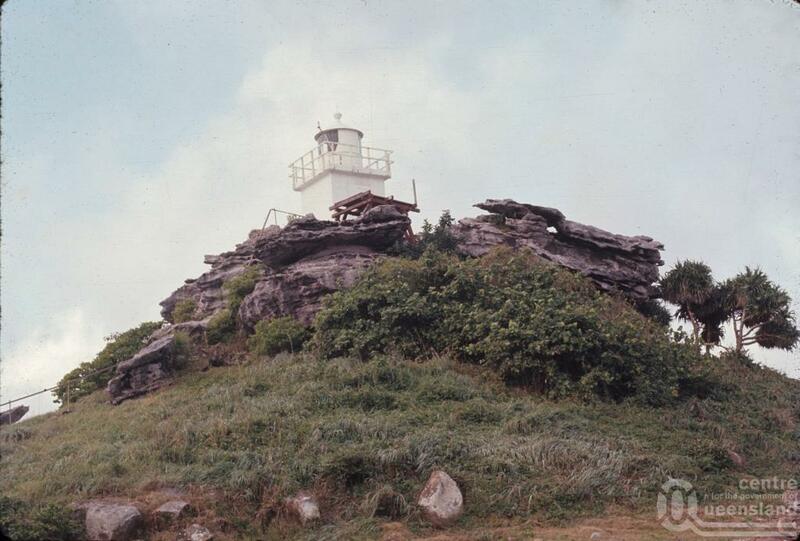 The original lighthouse, a small square wood tower, was blown over by a tropical cyclone in 1911. The 3rd order Fresnel lens from that lighthouse is on display at the Port Douglas Court House Museum. Located on the headland on the east side of the harbor entrance in Port Douglas. Site and tower closed (private property). Site manager unknown. ARLHS AUS-191. Note: Cairns is the metropolis of northern Queensland, with a population of about 150,000. Founded in 1876, the city was a major Allied base during World War II and has become an important center of tourism in recent years. Date unknown. Active; focal plane 17 m (56 ft); four white flashes every 20 s. 16 m (52 ft) square pyramidal skeletal tower, painted white. No photo available, but Google has a satellite view. This light marks an entrance through the Great Barrier Reef for vessels bound for Cairns. Located on a reef just outside the main line of the barrier, about 120 km (75 mi) east northeast of Cairns. Accessible only by boat. Site open, tower closed. Operator/site manager: AMSA. Admiralty K3166; NGA 9948. 1973 (station established 1943). Inactive since 1992. 17 m (56 ft) octagonal tile-covered tower with lantern and gallery. Several keeper's houses and other buildings are preserved. Lai Zhien's photo is at right, Lighthouses of Australia has a page for the lighthouse, Lightphotos.net has a photo, TripAdvisor has several photos, Brent Roberts has a distant view, Bel Roach has a closeup street view, and Google has a satellite view. 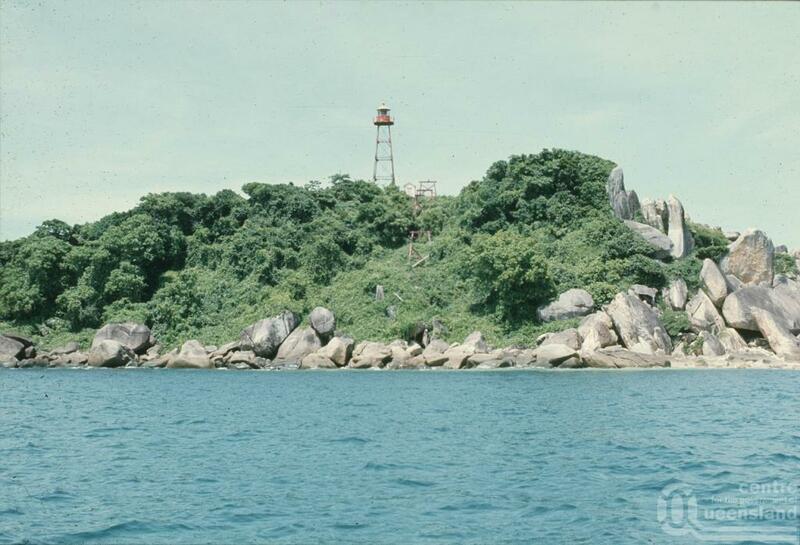 A light station was established on nearby Little Fitzroy Island in 1929. During World War II this light was supplemented by a light on Fitzroy Island. 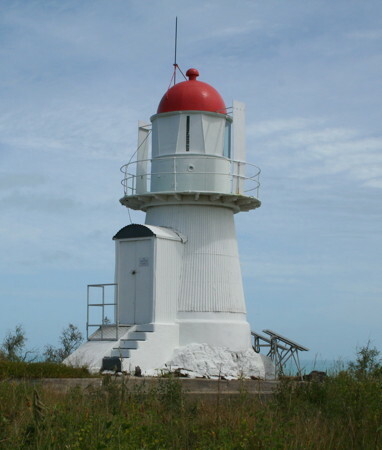 The Little Fitzroy light was deactivated when the present lighthouse was built in 1973, but then in 1992 it was decided to retire the lighthouse and move the active light back to Little Fitzroy once again. The lighthouse is now a national park visitor center. Syd Pipe has a historic photo of the liht when it was in service. Located atop one of the summits of a rugged island about 6 km (4 mi) off the coast of Cape Grafton, east of Cairns. The island is accessible by ferry from Cairns; the lighthouse is accessible by a hike of 3.6 km (2.25 mi) round trip. Site open, tower closed. Owner/site manager: Queensland National Parks (Fitzroy Island National Park). ARLHS AUS-074; ex-Admiralty K3168. 1992 (station established 1929 but inactive 1973-1992). Active; focal plane 33 m (108 ft); three flashes every 15 s, white, red or green depending on direction. 4 m (13 ft) round cylindrical white fiberglass tower. Paul Lew has a photo and Google has a satellite view. See the previous entry for the history of the station. A photo of the original lighthouse is also available. This directional light guide vessels to Cairns through the Euston Reef opening in the Great Barrier Reef. Located on a much smaller island off the northeastern tip of Fitzroy Island. Site status unknown. Admiralty K3168; NGA 9956. Date unknown. Active; focal plane 76 m (249 ft); two white flashes every 10 s. 17 m (56 ft) square skeletal tower, painted red. No photo available but Google has a satellite view. Located atop the highest of the Frankland Islands, a small group about 40 km (25 mi) north of Innisfail. There is a campground on the island, and transportation is available. Accessible only by boat. Site open, tower closed. Operator: AMSA. Site manager: Queensland National Parks (Frankland Group National Park). Admiralty K3162; NGA 9964. Date unknown. Active; focal plane 91 m (298 ft); white flash every 5 s. 11 m (36 ft) square white concrete tower. No photo available but Google has a satellite view. Located on a small island about 20 km (13 mi) southeast of Innisfail. Accessible only by boat. Site status unknown. Operator/site manager: AMSA. Admiralty K3138; NGA 9988. Date unknown. Active; focal plane 52 m (171 ft); four white flashes every 16 s. 15 m (49 ft) skeletal tower. No photo available but Google has a satellite view. Located on the southeasternmost of a short chain of islands off the north coast of Hinchinbrook Island, about 50 km (30 mi) northeast of Cardwell. Accessible only by boat. Site status unknown. Operator/site manager: AMSA. Admiralty K3132; NGA 10000. Lightship Goods Island. Scuttled in 2000. We need more information on the history of this ship. ARLHS AUS-225. Posted July 6, 2004; checked and revised December 24, 2018. Lighthouses: 41; lightships: 1. Site copyright 2018 Russ Rowlett and the University of North Carolina at Chapel Hill.